Our summer was full and crazy, with conferences, travel, camp and moving. We are still unpacking and hauling a few last loads from our old residence. Tonight we tossed out college papers, old greeting cards, VHS tapes, and mixed tapes—I cried, both relieved and sad at the same time. A few weeks ago I invited someone over for dinner. I think she assumed that I was inviting her to come help unpack some more. She has graciously helped, on more than one occasion. Are you overwhelmed again? She inquired. I don’t think her question was meant to be hurtful but it stung. Because, you see, I have been living in an overwhelmed state—long before we started the moving process. I have worked myself hard and long and neglected important things and I just can’t do it all anymore, nor should I.
I don’t want to be known as Miss Frazzled. I pride myself on being capable, productive and creative. But, I’ve hit a wall and I’m tired. There are good kinds of overwhelmed…like by God’s love, or the beauty around us, or the kindness of others. And then there are hard kinds of overwhelmed…because of sin, stress and self-induced over-scheduling. Let’s minimize stress by maximizing our dependence on the Savior. 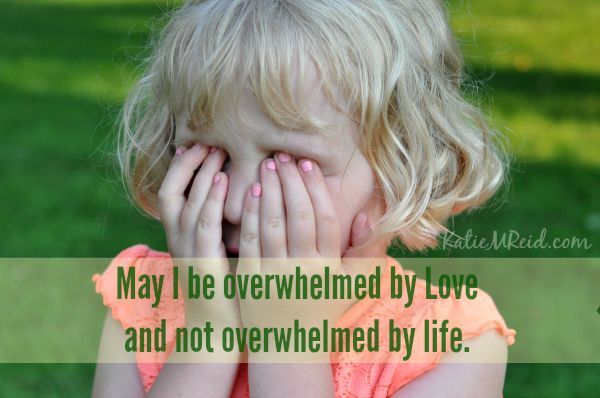 Let’s be overwhelmed by Love but not overwhelmed by life. If there’s one thing I hope to get overwhelmed, it is love.